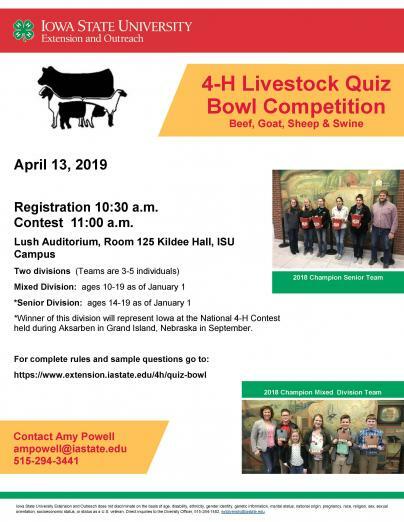 Livestock quiz bowl is a team event for 4th-12th graders where they test their knowledge of beef, sheep, swine and meat goats. Students use a buzzer to answer questions and the teams compete in a double elimination format by providing oral answers to questions presented by a moderator. The winning senior team will represent Iowa at the National 4-H Livestock Quiz Bowl competition in Grand Island, NE at the Aksarben Stock Show.